Sports therapy and chiropractic are closely linked – the tools and techniques are often derived from tested research in athletics. Sports therapy is a broad field, and the techniques used to treat athletes are derived from big budget scientific research. The good news for everyone – whether injured on the field of play or on the way to the conference room – is that you too can benefit from this science. With locations across the metro Atlanta area, we at Dynamic Spine and Sports Therapy conveniently provide the best methods and techniques for the human body to heal, whether injured as a professional or amateur athlete, employee, driver, or weekend warrior. These services are geared toward individuals with injuries that have not been diagnosed as “ripped, torn, or broken.” If an injury has been diagnosed as such, patients with that specific problem should seek attention from a different health care provider. If you need a second opinion or haven’t yet received a diagnosis, make an appointment. 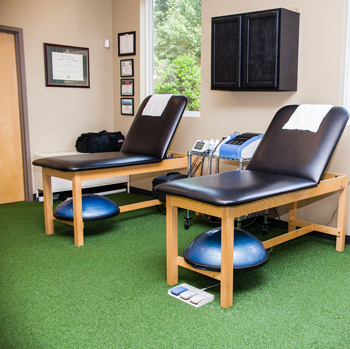 We can help diagnose your injury, whether “sports therapy” proves to be a component of your treatment or not. Finally, if you’re interested in a particular service or treatment, be sure to take a look at our Georgia chiropractors and become familiar with their various areas of specialization. You may wish to visit a specific location based on an area of specialization at that practice. Or, contact us and discuss your needs with our staff. We are all metro-Atlanta based, and we look forward to hearing from you.